Thank you for checking out our page! Feel free to browse each page thoroughly, using the sidebar to navigate quickly between categories. Some pages may be under construction, the page is still in it's Beta Stage, so thank you for your patience, we'll sort of the glitches soon enough! Jeff Bianchi Studio "Black Market Mix"
Due to trouble with Jeff's Mix Board, we'll be reshooting on January 7th at Noon at a new location for us: Grace Chapel out in Skaneatles New York. We'll post pictures of the new set up then! The Give Us Jersey set is 2/3 of the way through production! We only have a few more shots left for their more intricate video, and Music Video # 2 (the names are confidential until the release of each) will be a breeze. Keep tabs for more updates. As planned we were incapable of getting all of production done in a single day. However, our second day of production has been put on halt due to a surgery Mike must undergo, which will put him out of operation for quite a while. However, once he has fully recovered, we will approach this head on once again. After receiving the approval of Kyle's family, we'll be uploading the video to the page shortly to show off what we are capable of doing highlight reel wise. For forewarning, we did not film this material ourselves, we just edited it so please do not judge the quality of the image. We would like to thank the Hastings for giving us this opportunity. We're currently working on quite a few projects, and have a lot of news for everyone! Here's a picture of a Rough Draft of the Color Grade of the Give Us Jersey Music Video! We've done two days of production and hopefully our third day will go as well as the first two, both of which went as smoothly as imaginable. We've been extremely busy on all of our projects. Check out our "What We're Up To" section for updates on Kyle Hastings, Mike Quercia, Give Us Jersey, and Jeff Bianchi's projects. So, as break continues, so does our busy schedule. So far, we've gone through a day of shooting for Jeff Bianchi's Studio shoots, and will beginning day two soon, wrapping up production. We've got two pre-production meetings on the 28th, and just received a new editing gig! 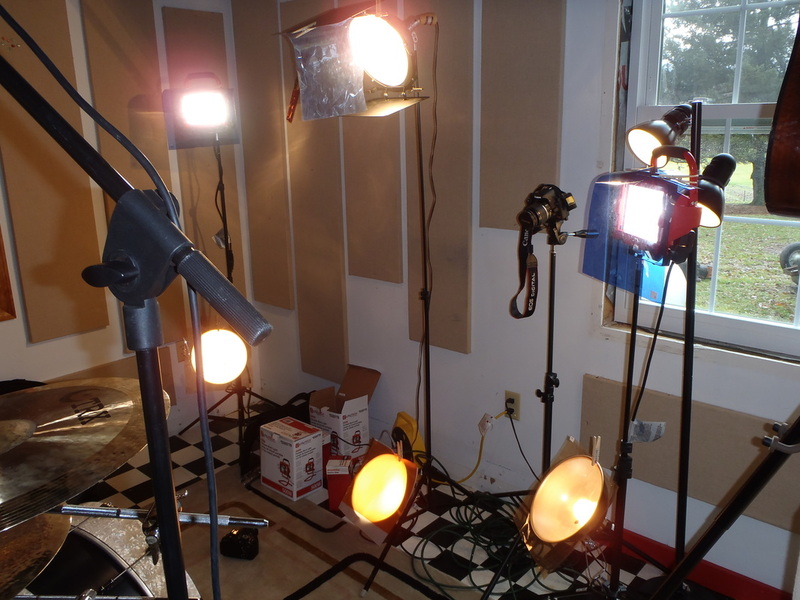 Here's a picture of our lighting set up on Jeff's shoot, we'll be releasing the videos soon. To here more about the shoot, check out our "What We're Up to Page", there's a more in-depth breakdown blog post there. Give Us Jersey, an up and coming pop-punk band based out of Syracuse, NY, and I have agreed to shoot two music videos soon, just in time for the release of their new album! We'll be touring for them for a little while, gathering some live footage, and we'll be shooting the music video in our hometown here in Syracuse! To find out more about this event, check out our "What We're Up To" page! Breaking onto the rap scene, Mike Quercia signed us on to create his first music video for his single: Terrible Thoughts. On the 28th, we have a meeting with an old friend about use of locations, and locations for this project is going to be a lot of fun. We're going with classic Wes Craven themes so-- you'll just have to wait and see how the final project turns out! Although it's not our most exciting project, this is a good opportunity for our little company: a family friend has asked us to edit together his high school football highlight reel. When this project is complete, we'll be able to reach out to other athlete's using his reel as an example of what we can do for them as well. This project will be completed soon, and we'll be uploading it to the page shortly for you to see. As the year comes to an end, our busy season begins! With two projects about to go underway, we are planning on keeping ourselves busy! With an ever expansive crew, we're coming back with a few new faces, and a lot more talent. Also, in the christmas spirit, we have a christmas present from us to you: A giveaway like none you've ever seen before! We're doing TWO FREE OF CHARGE COMMERCIALS and THREE FREE OF CHARGE MUSIC VIDEOS! We need to get our name out there, and we're willing to make some free work to prove that we have what it takes. So, take advantage of the situation and send us an email. If you don't have a band or a company, spread the word to a friend! 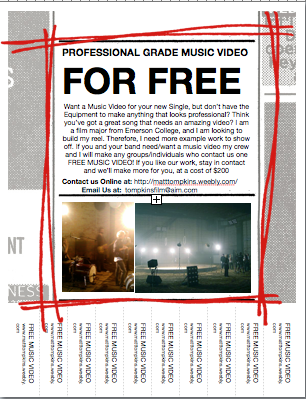 We're willing to produce for you a professional grade music video for free! How cool is that? Check out the posters that will be going up around Syracuse hoping to get our name out there. 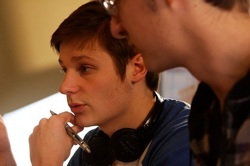 Check out Matt Tompkins's 2011 Director Reel. All of the clips within this reel were taken directly from Matt's work, all of which were made within 2011. We thought this would be a nice christmas present for everyone. We promise you'll be impressed. As summer comes to an end, so does the largest portion of time Matt Tompkins and Freelance Film Work have to work on projects. However, this has been a pretty good summer in retrospect. With the launch of our new website, enough footage to sink a ship with for our new cooking show, (sneak peaks coming soon), "The Orientation" started and completed, the independent project "Shoot", (which the picture to the left is from) and the scheduling of another series of shoots with studio drummer Jeff Bianchi, we've kept ourselves quite busy. Hopefully Winter Break will be just as productive, if not more! We've been pretty busy recently shooting a few projects currently. You should really check out our What we're up to link on the left. 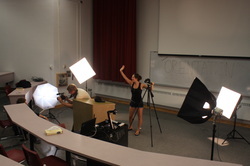 (Picture of Matt Tompkins and Lexie Greenhalgh on the set of "The Orientation"